It has been a while since I reviewed products, so here is one that features the ingredient ‘Rose’. I was never a fan of the floral fragrances one often finds in perfumes or skincare products. But when you choose natural products, you will find that the fragrances are mild and natural. This is because the essential oils, flower hydrosols or distilled waters used in these products, carries only the natural fragrance of the actual flower, which is very mild. That is exactly why these natural scents fades away sooner than the chemical fragrances. This product has a heavenly fragrance. It is sweet, divine and the product looks delicious (reminds me of Rooh Afza, but no you shouldn’t try it). I wish the brand made a body butter in this fragrance. Ingredients: Organic rose, red wine, organic cane sugar, organic sea salt, organic honey, English rose essential oil. The product comes in an interesting plastic pouch with nozzle. This makes it very convenient to use just the right amount of product and also travel friendly. The body polish is mild and can be used by even sensitive skin types. It is very moisturizing and leaves the skin soft. The texture and fragrance combined makes the bath with this polish a very luxurious, spa like experience. The only negative I can think of is that, the sugar and salt melts easily on skin. So this is not really a body scrub incase you are expecting one, but a buff thTat gently polishes the skin. This is a great addition to winter skincare regime as it effectively helps in removing the dead skin without stripping the moisture off. This is a light night gel and not really a night cream. It would suit mostly normal to oily skin types and can be used as a day time moisturizer as well. Key Ingredients: Essential Oil of Rose & Bergamot in an aqueous Extracts of Bay & Neem Leaf, Cinnamon & Cupressus Bark & GlobeThistle Flowers, Wheatgerm, Jojoba, Grapeseed, Almond & Lemon Oils in a plant derived base with Beeswax. Negatives would include the steep price and the misleading name (I was expecting a cream and not a gel based formulation).The product comes in a small glass amber tub, which makes it not so travel friendly. The product claims to be 100% natural and 77% organic. I find the name of the product really cute and it has impressive ingredients. I have tried many natural hand creams most of which leaves the skin slightly oily. This one is light, non greasy and gets absorbed very fast. Just like the Ayca cream, this also has more of a gel like formula and hence has to be reapplied after few hours, incase you have extremely dry skin. Eventhough you will find numerous benefits of rose essential oil and distilled rose water online, here are the reasons why I like rose petal powder the most. It is a very versatile ingredient. A tea from the powder, can be used as a toner, for mixing face mask powders or as a hair rinse. The powder along with sugar/salt and honey makes an excellent body scrub. The powder mixed with aloe gel makes an excellent mask. Read this post for rose petal powder based recipes. Incase you are looking for affordable & good quality rose water face mist, check out this post . This is the review of the simplest and purest body scrub I have ever used.For those of you, who are new to this brand, here is a small brief. Junaili makes cold pressed apricot oil with the finest apricot grown in Himalayas, maintaining high quality. They make pure cold pressed apricot face and body oil apart from the scrub. It is a family owned brand and the products are made in small batches. 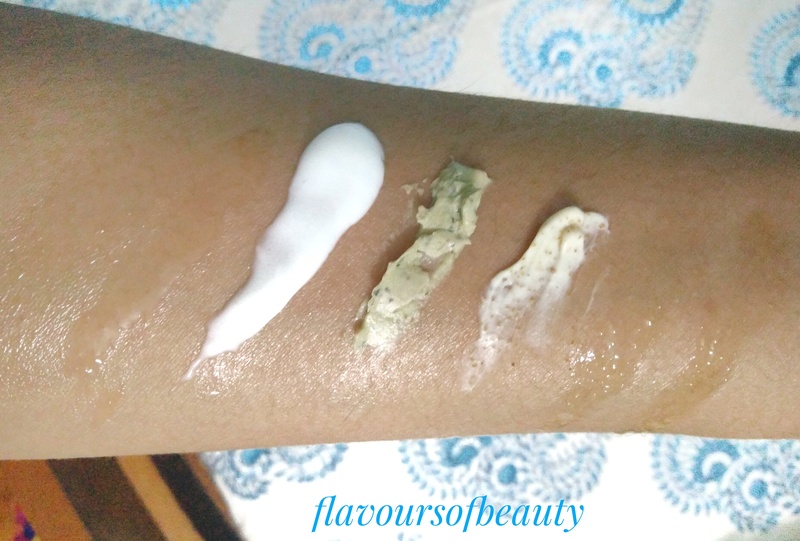 Coming to the review, I am quite impressed at how a scrub from an Indian brand, made of one pure ingredient can be so effective, when compared to a whole bunch of other scrubs in the market boasting exotic ingredients from all over the world. For starters I am not a big fan of sugar scrubs. Mainly because the sugar tend to dissolve away in a jiffy when rubbed on wet skin.I like to massage the scrub for a while for maximum benefit and nut shell scrubs like walnut kernal ones tend to be harsh at times. If not any of these, the scrub can be a bit drying for my already dry skin. I received it in the December reverie box. You can also buy it individually from their site. 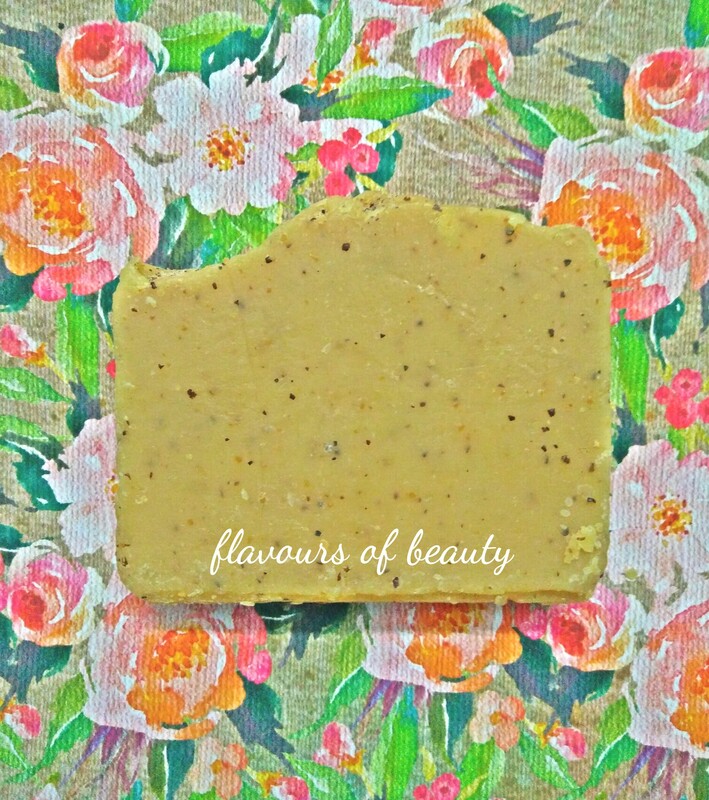 Texture and fragrance : This product reminds me of the classic malt horlicks. The smell is slightly similar as well, pure and ‘apricoty’. The scrub is a gritty powder. Packing : The scrub comes in a travel friendly plastic jar with a metal screw cap. There is foil seal on the mouth of the jar for protection from spillage. I have just made a small hole in the foil, and all I got to do is shake the jar to get the powder. This ensures that the product doesn’t get contaminated with water when kept in bathroom. 1. For oily/sensitive skin : Combine the scrub with water to make a paste.Massage it all over the body or on those dry areas. Water makes the scrub smooth and mushy like oats and hence doesn’t irritate sensitive skin. 2.For dry/flaky skin : Mix the scrub with body oil (any light body oil like almond, apricot,olive oils),it stays gritty and helps slough away all the dead skin without having to use more product (as oil doesn’t make the scrub mushy). Using a body oil also gives that extra boost of moisturisation. I generally mix it with Gia body oil (read the review here), which is a very light oil with mild floral fragrance. I wash the scrub off and without cleansing with soap, as this oil moisturises skin without making the skin oily. Happy New year peeps!!!! Hope you all had a wonderful start of 2017. I am looking forward to introducing many more natural skincare products to you this year. 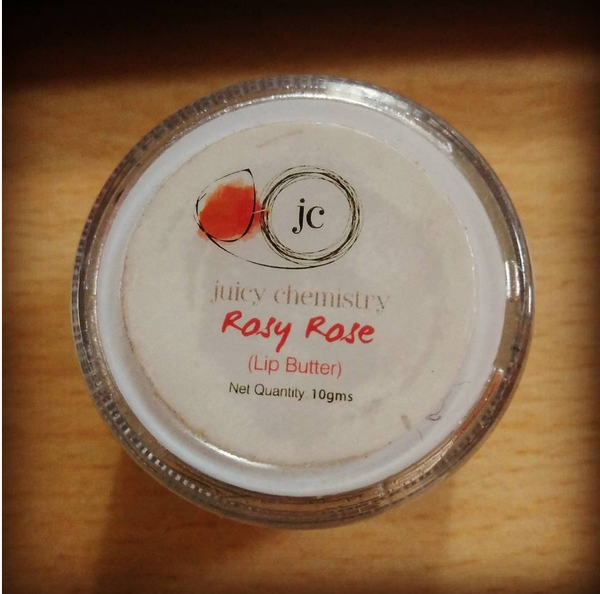 Since I did not want to limit the post to a product review, I am listing out all my favorites from the brand Juicy Chemistry. While reading reviews on natural skin care brands, I feel that rather than a constructive criticism and comparison, the posts usually just contain praises. Say you read the posts on body scrubs from these chemical free skin care brands, and every post says they are all good. So how do you choose. If all are good, how do you know which one suits your skin best? That is why you should know your skin well and know the skin type of the person who has written the post. Ask questions to bloggers and reviewers before getting a product. 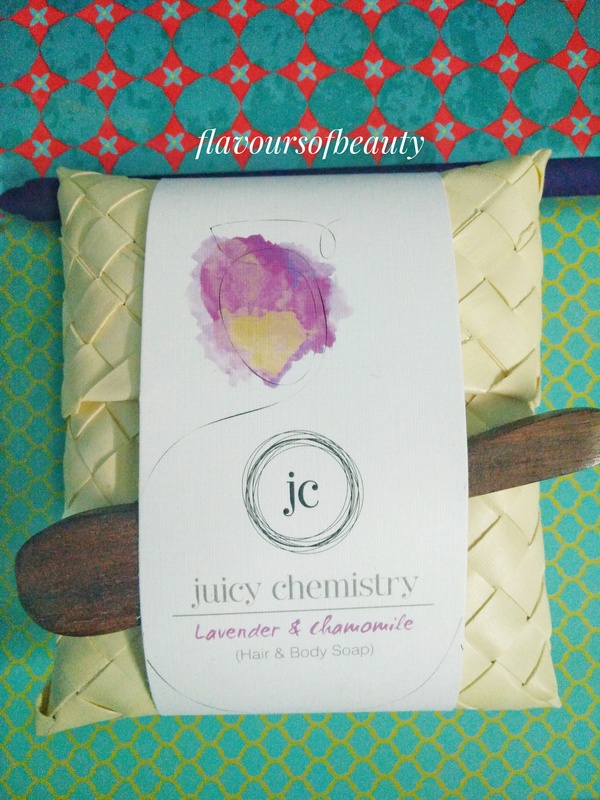 Juicy Chemistry is a familiar name for my readers as well as natural skincare lovers. Based on Coimbatore,t he pure and totally chemical free products of this brand, provides effective skincare, in addition to making you smell so wonderful. Ohhh yeah, the fragrance of aroma oil blends in their products are so exotic. 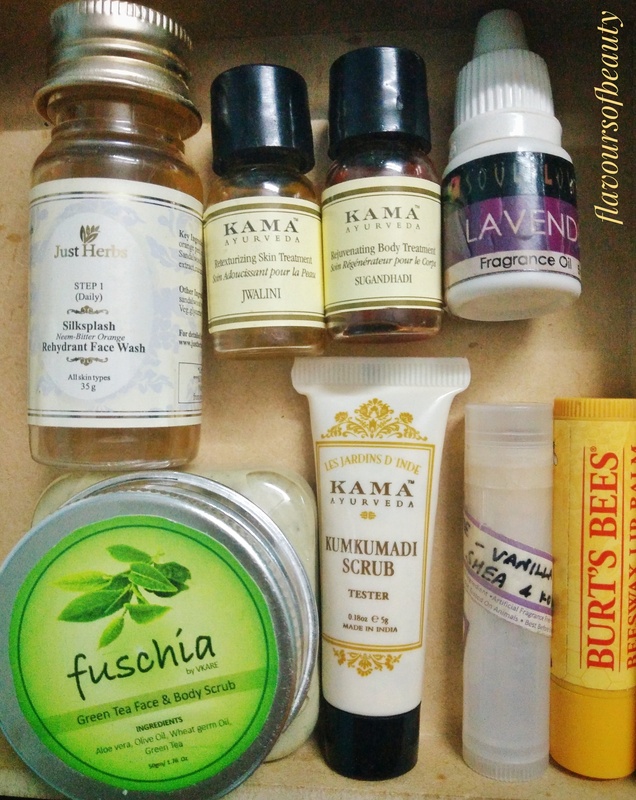 I am not listing all the products I have used from them (yes there is a lot), but just a mini review of my favorites and not so favorites. I totally recommend body butters from JC, for normal to dry skin. They smell so decadent and pure. I even use it as a body pomade, for the fragrance is really wonderful. The ones I love are the Choco mint, Rose and Jasmine variants. The fragrance is not heady and the body butters melt to form oily films when applied on skin. Massage it well and the skin stays nourished throughout the day. These are not for face or for people with acne prone/oily body skin. The coffee and green tea eye cream from the brand is made of very impressive ingredients like green tea and coffee infused almond oil, mango butter, lavender essential oil etc. But this one failed to impress me. Can’t call it a cream, as it is in a condensed oil form. Take a bit and apply it under and around the eye area, and it makes the whole area very oily. So cannot use it if you are going to step out. Also if it goes in the eye (which is very likely as the oil spreads on massaging the eye area), it really stings. I used it regularly over a period, but it did not do anything for the fine lines under my eyes. I don’t have dark circles, so can’t comment on that.It can be very nourishing for the skin I feel, but somehow did not work for me. The two face masks I tried from the brand, Rose-sandalwood and Tea tree-Charcoal masks helps control the oiliness of oily-combination skin types. These masks are in powder form. 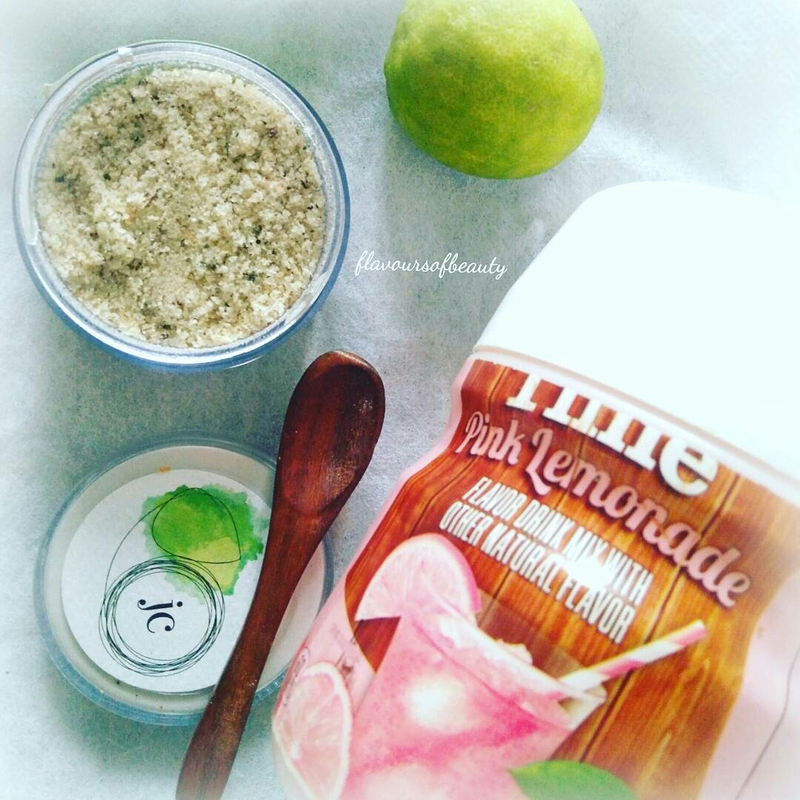 The rose face masks feels warm on skin whereas the tea tree variant has cooling effect. These are made of essential oils and clays and doesn’t dry out the skin. Eventhough it did not draw out any black heads from my nose, this really works in clearing out acne and scrubbing out dead skin. On making a paste of the powder, with water, the texture resembles that of paper pulp. It is soft and non gritty when wet. But on drying, this gets gritty and acts as a scrub. The cooling effect of the peppermint oil helps in calming the skin after a long tiring day in the sun. Well this thick yellow cream for dry skin, obviously did not suit my combination skin. But I wanted to try out a night cream and this is one of my early purchases from JC.This is very oily and it did break out my skin. I am not a fan of the fragrance of this one and also this is something that suits dry to very dry skin types. Love the orange candy lip balm but not the rosy rose one. The lip balms came in tubs (now they have them in tubes as well) and I really liked the consistency of the balms. The orange candy one really worked for me as it was moisturizing and the taste was not bad either. The lip balms melts on applying on lips and forms a thin oily layer that really helps moisturize dry skin. But the rose variant disappointed me, as it stings and I did not like its taste either. The brand has in stock, a wide range of cold pressed soaps, each for specific skin types or addressing specific skin problems. Eventhough these are really expensive (yes you will get a hole in your pocket), these are made up of high quality ingredients and are very decadent. Love the citrus blast of the foot scrub and pepperminty cooling effect of the foot cream. The Argan and Rose day serum is made with oils of raspberry seed and carrot seed, containing natural SPF. It has saffron, rose oil and other effective skin care oil blends as well. Well I neither love nor hate this one. I didnot see any visible effects of the serum on skin, though i like to believe that it protects my skin from pollutants and UV rays. I hope you liked this post. Let me know your JC favourites and the products that really worked for you. “Fuschia was born out of its parent company Vkare Bio Sciences in 2013. 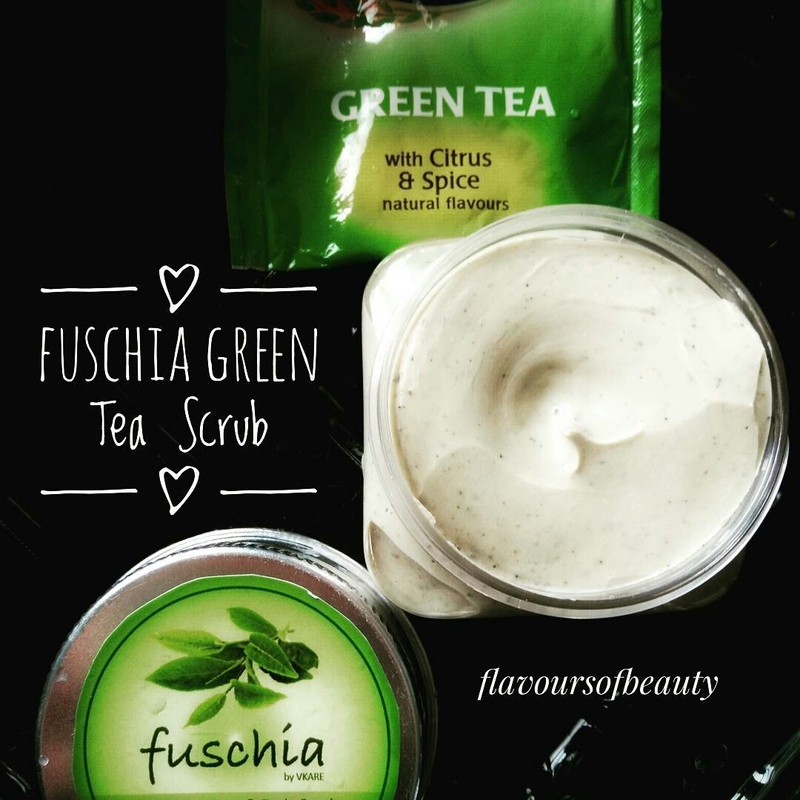 Since its inception, Fuschia has come up as a natural, handmade Skincare products brand.” The products they make are free from SLS and paraben. If you are my Instagram follower, you would have already seen the box of Fuschia goodies that the brand had sent me a couple of weeks back. I was very excited to try them out and has been using them for a while now. I feel the products came at the right time, as winter is already here and I needed to change products to suit the dry climate. I tried the green tea face and body scrub first and I should say it is very different from the scrubs I have been using so far. Did I like this one?? Read along to find out. Free of SLS, parabens, phthalates, artificial tints & synthetic perfumes. Ingredients : Aloe Vera, Olive Oil, Wheat Germ Oil, Green Tea (only these are mentioned in the pack). Price : 200Rs for 50g, 450Rs for 100g. Packing: It comes in a very handy, travel friendly, cute plastic square tub. The product is very thick and dense. The screw in metal cap closes the tub tightly and is hence spill and leak proof. Fragrance : Very pleasant and mild. I feel it must be mix of fragrance oils as it doesn’t smell herbal. Green Tea is rich in antioxidants,which helps in fighting against free radicals responsible for causing ageing. 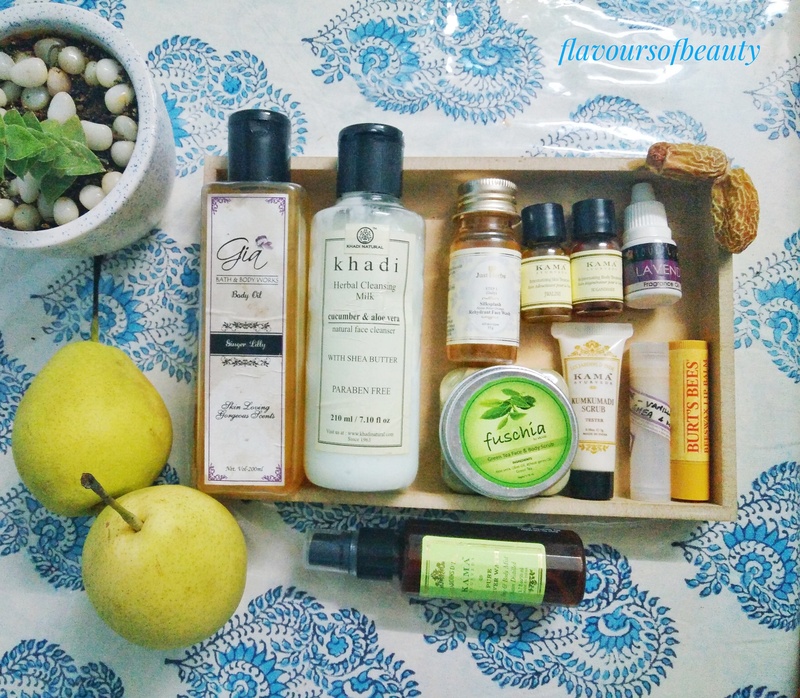 I recently found out (after using green tea soap from Cape of Good Hope) that products with green tea really suits my combination skin. 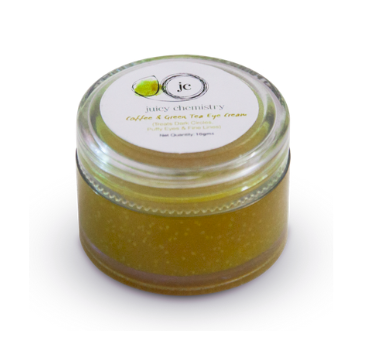 This scrub has a very dense creamy texture with very mild green tea leaf particles for exfoliation. You can see the scattered green tea leaves throughout. 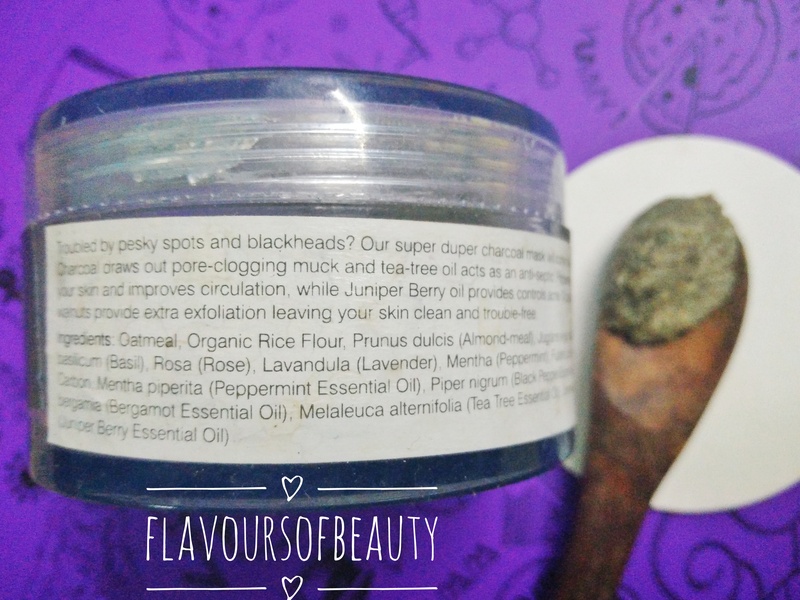 With the goodness of potent natural ingredients, this scrub will suit all skin types. It is soap free and hence doesn’t lather. This makes it apt for winter, as soap often strips the skin of its natural oils. A very small quantity is enough for the face, as it can be spread well on wet face. Mixing a little water will help if this is too dense. Massage in circular motion as suggested by the brand and wash it off. The skin feels refreshed and moisturized, after. On my combination skin, this did not leave any oily film after washing. So I believe this must suit oily and dry skin equally. 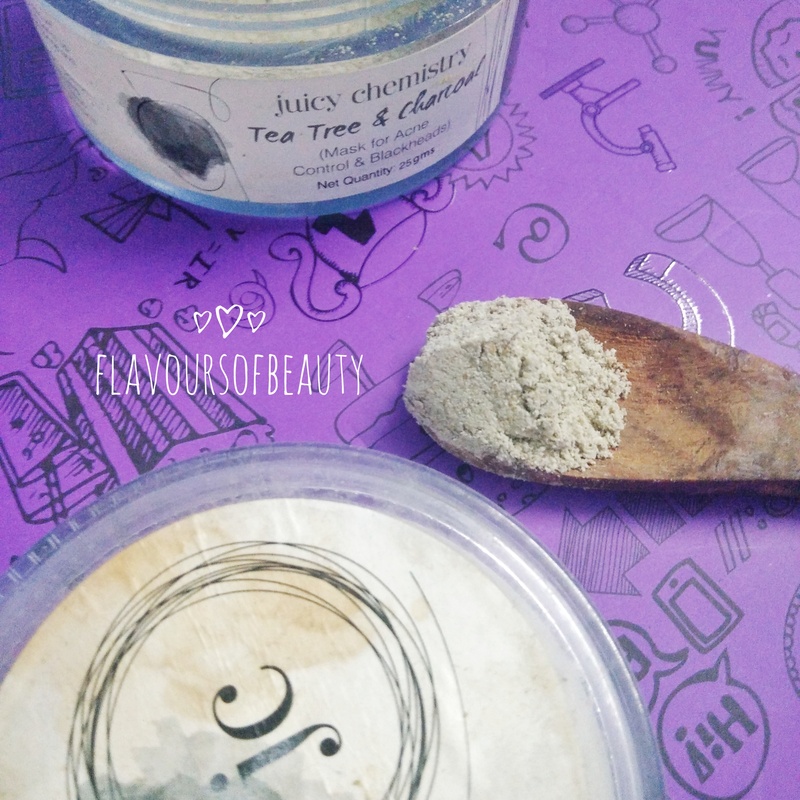 This light greyish green scrub can be used as a face pack as well. Leave it on for about 5min before scrubbing it off, to get that extra suppleness and softness of skin. It is very gentle and doesn’t irritate or stretch the skin at all. Also this tub will last me really long, as the quantity required for each use is very less. Complete ingredient list is not mentioned in the pack. Even though the product claims to be a body scrub as well, I find the particles too gentle for dry body skin. This is best as a face scrub. Ideal for winters but in summers, this can make skin a bit oily for oily skinned people, as it is soap free. This definitely soothes the skin and makes it supple, but I am yet to experience acne controlling ability of the product. Even though this was sent as a review sample, I am fairly impressed by the efficacy and gentleness of this scrub. It took me a while to actually get used to the non-harsh particles of this one and thick texture. But I really loved it after. It is suitable for the dry and chilly winters and I sometimes even skip the moisturizer after using this.